We found the hotel to be clean. Our room was cleaned at least 4 times during the week and our towels changed 4 times which is twice as many as we were told they would be. The swimming pools were good but a number of the sun beds were broken. We were on the 10th floor and one of the lifts was not working for half the week. Most of the food was very good but at times could have been hotter. There was plenty of choice including continental. For lunch and dinner there was usually 2 meats, fish, pasta, salad and rice dishes to chose from or mix together plus around 20 desserts. There was a self service snack bar near the main pool with a range of salad and burger's etc to use from 10am till late afternoon. You could also help yourself to tea and coffee,soft drinks and beer. The location of the hotel is not to bad as its only a small resort. The closest beach is 300 mtrs away but has 142 steps to get down to it. The other is about 800 mtrs away. The cliff top walk is the nicest way to get there. The sea was flat calm one day but on another waves were breaking over head high close in. There are a few shops and bars about 500 mtrs away. Most of the staff were very helpful but were let down by the bar staff. If they chose not to serve you you could wait for ages while others walked up and got served at once, particularly if they were female as my wife and myself found out several times. We can not comment on the day time entertainment as we did not take part, but what we did see looked to be quite good. The evening entertainment was terrible, quite easily the worst we have seen in all the A/I hotels we have been to. They called a quiz a show. There was only 2 visiting acts during the week,both of which were watchable but the other nights were poor. We would visit again because we did have a good time. Week summer break for all the family, The kids loved it. The pools were the best part of the hotel, freeform and shallow enough for the smallest. The rooms were clean and pleasant, we had two adjoining room both with aircon. Cooking facilities but we didn't need them with it being all-inclusive. Not to far from the beach and the resort center. Food was well cooked and plenty of it. Day time entertainment was ok and for all ages but the only thing to let the hotel down was the same entertainers did the evening shows, I would expect outside professionals for the evening shows. After reading the reviews about this hotel, we were a little sceptical about what we we letting ourselves in for. When we arrived at the hotel the lobby/reception was spotless clean and this gave us a little hope, we checked in and was informed that we could go for food as soon as we liked. The hotel food was very nice and plenty of choice, if you did not like something, there was always something else that you could have instead or alternitively visit the snack bar which was open 10.00am - 6.oopm. The location of the hotel was within walking distance of the shops, bars and beach. The entertainment in the hotel was not the best but we were able to put up with it because the rest of the holiday compensated for it. We would definately visit this hotel again!! By the end of the first week we found that we were hungry all the time as the food had gone down hill. The snack bar food was always cold and the choice of food in the main restaurant was at times frightening. On one occasion we had the choice of paella, squid rings or mussels, we eventually gave up and decided to eat out. We had been told by family and friends that we would need little money as we were all inclusive ha ha what a joke! We spent a fortune!!!! The pools were lovely and every morning I would watch a man from my balcony cleaning and put chlorine in but by the end of the first week one of the pools never had chlorine in. The water went a green colour and we reported this to our rep who in turn reported it as the manager and the two cleaners came to see it but they did nothing and it was left. The drinks were free flowing from morning till night but it didn't matter how much you drank it had no effect at all? Then the life guard disappeared. The snack bar which was beside the pools so even the smallest of children could be independent but that closed meaning that parents had to go to the main dining hall a good walk away for food and to the bar again a good walk away for drinks. We asked our rep if we could come home early she told us no but she would see if we could move to another hotel, later that day she told us we could move but would have to pay. Our money was running out fast and we were worried that if we moved and the food was as bad we would not be able to eat at all so we stayed. It is a terrible shame because it is a beautiful place, the hotel, staff and reps were great and I know it was coming to the end of the season but we paid good money and expected to receive the high standard that we got in the first week. Would not know where to start- stayed in a studio appartment came with microwave and fridge - good you would think. But no you had to hire a kettle (which there was none) and when you got to your room there was no cutlery no plates etc etc?? All inclusive.... I went with a friend and her child...well apart from stomach upsets etc etc - yes in Spain. Well back to the food if you like breaded cauliflower and breaded squid during the day with chips and fish with bones and fatty leftovers of what they call meat with chips then this is the holiday for you. Our kids were left hungry there was nothing for adults to eat let alone kids. There was ants in the dining area. If you did go to breakfast in the hope there would be cereal you would have to keep asking the staff for the milk to be brought out. Had to chase the reception staff and rep for sheets to be changed after being left five days. Still nothing happened. My friends son was sick in the night so she rinsed the sheets and put them on the balcony and first thing informed reception asking for the bed to be made etc. Went to the room at lunch - nothing had been done. She went back and explained that the floor needed cleaning and her sons bed needed sheets etc. Well at tea time we went back to the room and found clean sheets just put on the table - dirty sheets still there and floor still sticky and smelly. Just could not believe it. Staff were miserable - and by week two it rubbed off on us. Entertainment was poor kids where bored. Week two we had to go into town to eat as we couldn't watch our kids not eat and we where all poorly. There was quite a lot of families who where in the same situation and nobody including the reps and the hotel staff where interested everyone just kept making notes. We stayed in the Euro Calas in June of this year the food was non eatable and cold, the beer is served in plastic glasses all the time. The entertainment was out of this world a lot of idiots miming to everything, we both know the words to Grease backwards. The bar staff was really brilliant we only asked for one drink just had to old 2 fingers up and they were there waiting for us even when the bar was full. The hotel is about 15 mins away from town centre, the free transport they said was available was not there it was full every time it got round too us so they just went past, a lot of the bars was not open they said the end of June when every thing is running, we won't be going back there. When I booked my holiday at relatively short notice I was pretty exacting in my requirements, All Inclusive, Air-conditioned room, Cot, Microwave, Kettle basically catering for a family with a teenager and a baby in a resort that was family orientated with easy access to the beach. My flight times meant late arrival in resort, however, I did expect my accommodation to be ready. It took some wandering around with one of the staff to find a cot; this was rescued from a cleaner's cupboard and didn't come with bedding. Luckily we had travelled with some bedding and improvised, as we were too exhausted to deal with the problem immediately. Prior to breakfast on the day of arrival we informed the reception that the cot was not good enough, hygienically and because of the lack of bedding and also that our son had no bed made for him or bedding available. The kettle in the room was none existent and we had to use a pan to boil water. Our son's bed was made that day, however, it took 2 further complaints until the cot situation was remedied on the afternoon of Mon 22nd, and repeated complaints to the rep to get a kettle - it was actually quicker to heat water in the sun, the kettle was actually more like a pan with a plug on and extremely unsuitable to boil water even relatively quickly. The general standard of the room on arrival was below what I expect of a 3 star Hotel, bathing the baby in a bath that has been poorly painted as a result of which the paint comes off is very disconcerting for a concerned parent. My wife and I had single wooden box frames with uneven wooden legs masquerading as beds, however, given the rest of the problems we incurred our own sleep depravation were minor concerns. The problems with accommodation paled into insignificance when compared to the standard of the food, inedible and unhygienic. The food consisted of soggy chips with various assorted meat dishes swimming in grease. The culinary highpoint was breakfast when I made the toast, other than that I would have to say the food was unworthy of 1 star. The food was wholly unacceptable, with poor standard of presentation only surpassed by the limited choice of food and the poor quality of the menu. Fortunately we had sufficient funds to enable us to eat out, however, this was unexpected and certainly not budgeted for. Attempts to venture out of the hotel were also disappointing, access to the beach could only be achieved courtesy of the hotel shuttle service, which was poorly organised, queuing for the bus had little effect when other holidaymakers just barged past, my main concern being the well-being of my baby. I would be interested to hear how my request for a Sea View, 'subject to availability', could ever be realised given the location of the hotel in relation to the sea. After warning the tour rep that a change of hotel would probably be necessary, on Wed 24 Aug at the reps early evening appearance, a move was requested. It was agreed that the rep would furnish us with further information at her morning appearance. The reps morning appearance did not occur, a note had been left with reception, however this had not been passed to us, and although repeated visitations to reception to ask as to the reps whereabouts where made, patience being a virtue, I waited until midday before phoning the resort office. Eventually the reps apology note surfaced about the same time as the resort office was attempting to find alternate accommodation just about summing up the 'manana' attitude of the hotel staff. 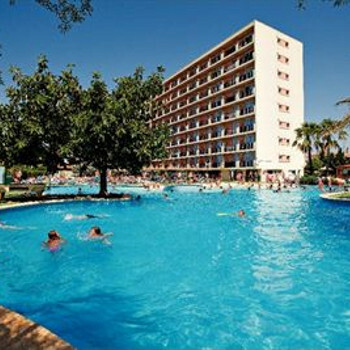 Stayed at Club Eurocalas for 2 weeks returning on 16 July. Has changed ownership in last 2 years and is now totally all inclusive. Very European with German, Dutch Spanish and French guests in majority over those from UK. Stayed in 1 bed apartment which was of good size, cleaned daily, towels changed every other day and bed linen on day 8 of stay. Fridge in apartment and microwave but not toaster or kettle as advertised in brochure - some other apartments did have. Gardens, pool area, bars etc kept clean and tidy. Plenty of bins round pool area. Plastic glasses in use everywhere - even in restaurant.